Trump avoided answering whether he's considering a new separation policy. President Donald Trump offered praise for White House aide and immigration hardliner Stephen Miller on Wednesday but pushed back on the notion that Miller is the force behind his tough approach to border security and the ongoing leadership shakeup at the Department of Homeland Secretary. “Frankly, there is only one person that is running it. You know who that is? It's me,” Trump said, pointing at his head, when asked about the Department of Homeland Security and whether he would ever consider appointing Miller to lead DHS. "Stephen is an excellent guy. He is a wonderful person. People don't know him. He has been with me from the beginning. He is a brilliant man,” he said of Miller. 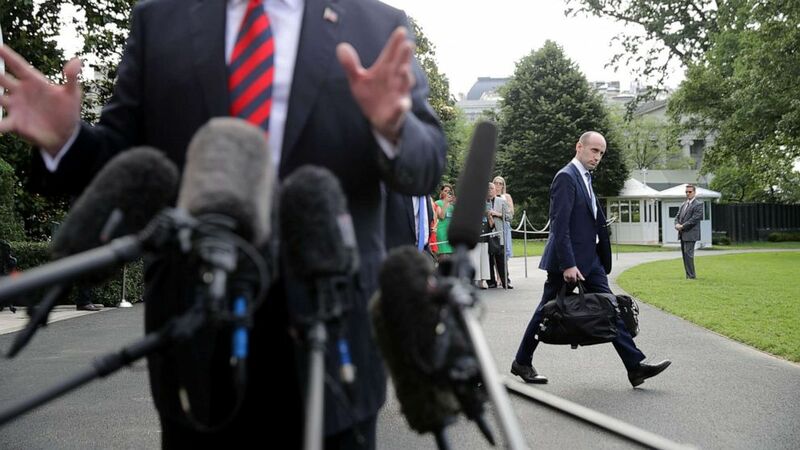 (Chip Somodevilla/Getty Images, FILE) Senior Advisor to the President Stephen Miller walks behind President Donald Trump as he talks to reporters before they depart the White House, June 8, 2018 in Washington. President Trump's outgoing DHS Secretary Kirstjen Nielsen is set to formally resign Wednesday, after initially submitting her forced resignation on Sunday. The current leader of Customs and Border Protection, Kevin McAleenan, will assume the role of Acting DHS secretary at the president's request. Trump's appointment of McAleenan resulted in another forced resignation of the department's acting deputy, Claire Grady, who was next in line to succeed Nielsen under DHS rules. The administration also announced on Monday that the head of the Secret Service would soon be departing the administration. “If we had the wall, the good people will not be able -- you'll see them on the other side of the wall,” Trump said. At one point, one of the attendees at the table said of some of those who cross the border illegally wear all-black outfits and stand on the porches of people's houses to intimidate them.